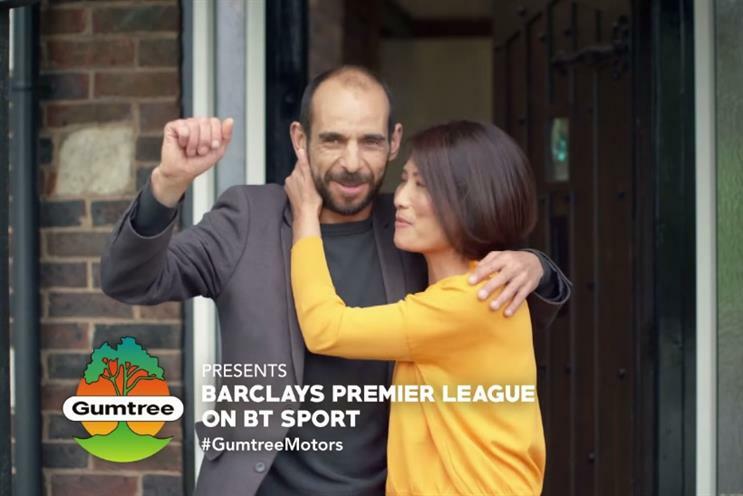 BT Sport sponsor Gumtree has unveiled the TV spots that will air before, during and after live Premier League matches. The idents are voiced by BT Sport commentators Robbie Savage and Darren Fletcher, and themed around car buyers and sellers on Gumtree. The idea is to push Gumtree's auto marketplace, meshing funny football commentary with the day-to-day experience of buying a car. Gumtree announced last month that it would sponsor all of the BT Sport's Premier League coverage, with the idents launching 8 August. The sponsorship is Gumtree's biggest broadcast deal to date, though neither BT or Gumtree are giving out financials. BT Sport's sponsor last year was William Hill, and it's possible this year's deal will be costing more due to the broadcaster's improved rights. The channel successfully won more rights in February to show Premier League matches, though rival Sky Sports retains the lion's share. The ads were created by BT Sport's in-house creative team and wilil run before, during and after matches, as well as on repeat and review shows. Gumtree's head of marketing, Hannah Wilson, said: "The sponsorship idents shows a range of great Gumtree moments; where much-loved cars are bought and sold and where memories are made and shared. We’ve worked closely with BT Sport’s Creative Agency to develop a funny, heart-warming and informative campaign which integrates our passion for football with the buying and selling of cars."